Weekly Photo Challenge: Wonder – Happily After Retirement! One year I attended a conference in Chicago in March. What a surprise to arrive and see the city decked out in green! 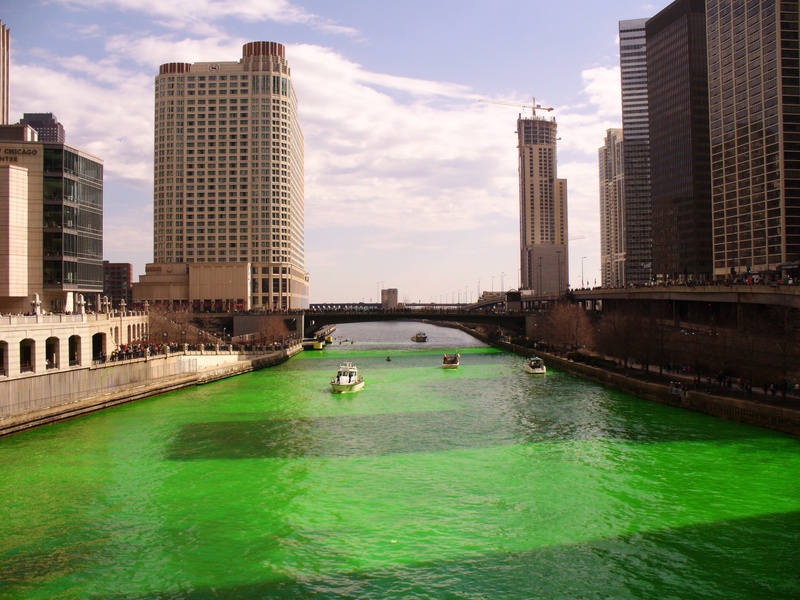 Truly, the river was green – it was an amazing sight to behold! neat eh? they do this to the Thames in London on St. Patrick’s Day as well. I had never seen anything like this — what a treat it was! St Patrick’s Day and Christmas!! There’s a reference to the green water in the movie, The Fugitive, but I didn’t realize they actually do it. Great picture. Thanks for the pingback, too. I think my Irish mother was smiling down at me when I saw this! Fantastic! I’m going to be in Chicago in March (daughter having a baby–due date the first week in March) so I’ll be looking at the river!! Woohoo! And remember to visit the downtown Chicago Library — take the elevator to the top floor and then look up and smile! Whoa cool photo! I’ve never seen anything like that before! Totally cool, right? It was one of those serendipitous moments that I still remember with a smile! Too cool! I love Chicago!